Oh no! It appears that this pair of gliders have collided in mid-air near the London Gliding Club! Presumably there were no survivors. Hum… if it’s not an image processing artefact, it’s a perfect snapshot of a near miss! (or not, the altitude difference might be great). A great find! This could just be the same glider with the images taken at different times. Couldn’t be. 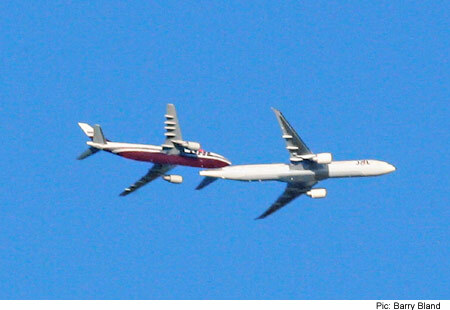 Then the images would overlap one another, so one image of the glider would cover the other one. But, here we see two gliders, so neither photo is covering the other. It is common for sailplanes (gliders) to travel in close proximity. One will find lift and attract others into the same thermal. Detecting 100′ vertical altitude difference from a satellite photo MILES away would be unlikely. No big scare. That’s just two gliders circling the same thermal. Could have many more. Still looks kinda cool anyways.. Ran across this sightseeing note while trying to research a glider/biz jet collision that occured recently, ~28/29Aug06, in the US. Regarding note 10 by Gwaer–the url is for a collision with one fatality that occurred about 12,000 miles away from the original “near London Gliding Club” image. I saw this reported on TV this morning and I, too, would love to know details on this. Any help would be appreciated.